You will need to set the proper format for the paper. Set the margins for one inch around the paper: top, bottom, left, and right sides. 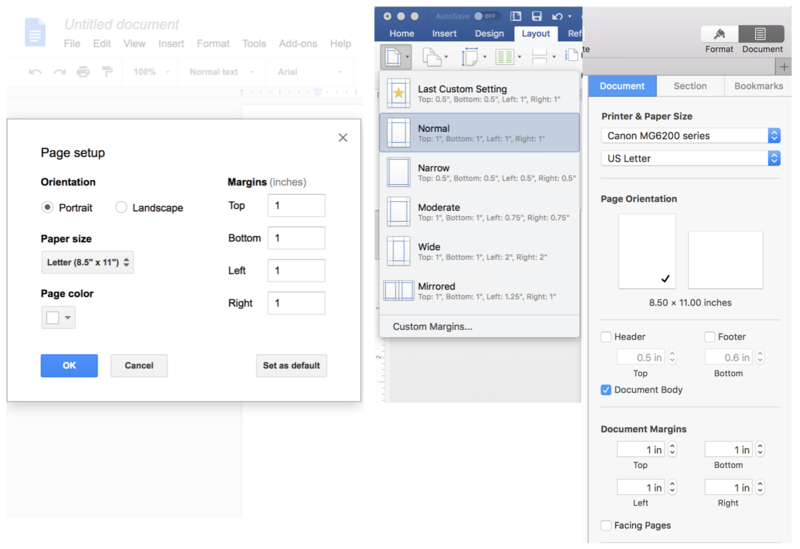 This will create a blank space of one inch from the edges of the paper to the type/fonts. Double space the paper. This will automatically leave a space between each line typed. 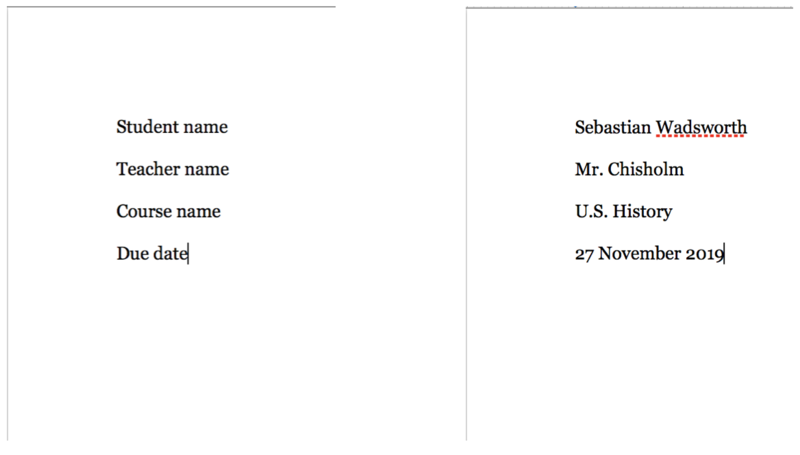 Microsoft Word: Format>Paragraph. In the text box, go to Line spacing and use the dropdown menu and click on Double. Click OK.
Apple Pages: Inspector>Format>Style. Under Spacing, go to dropdown menu and select Lines. To the right, use the dropdown menu and set the number to 2. Type the heading in the upper left hand corner. Include your name, the teacher's name, the course name, and the due date (day, month, year). Type an original title that gives the reader an idea of the outline topic. Avoid titles like My Essay or Speech Outline. Center the title. Do not put the title in a larger font or add bold, underline, or italics. Type the outline using the outline format. Use Roman numerals (I, II, III, etc.) and letters (A, B, C, etc. ; a, b, c, etc.) and numbers (1, 2, 3, etc. ; (1), (2), (3), etc.) in each section. Your sections may vary in the number of main ideas and details needed. 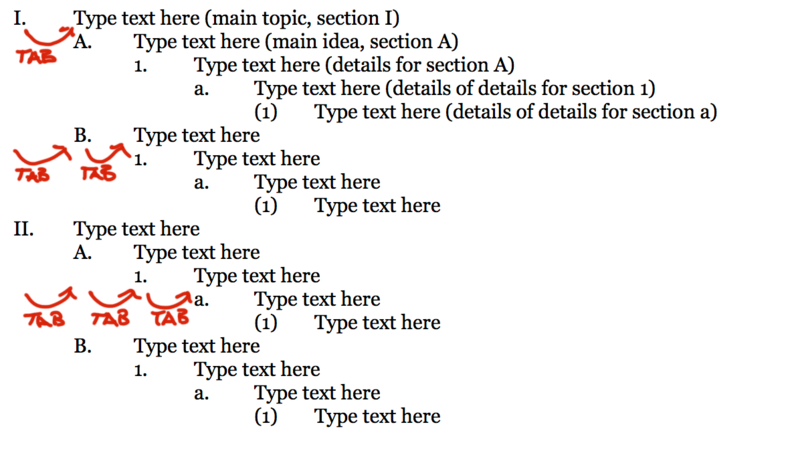 Use the TAB key to create a space between each section identifier and the text. If you have more than one page, put your last name in the upper right header on the first page. Leave a space and use the insert page number feature from the menus in your word processing program. Every page will then have your last name and the proper page number in the upper right side on all the pages. Print on one side of white, 8.5 x 11 inch paper using black ink only.